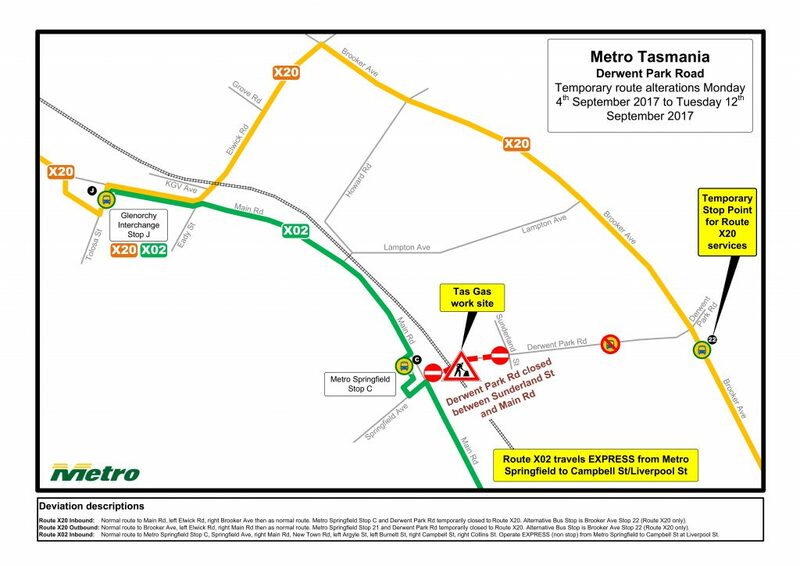 TasGas works on Derwent Park Road will disrupt Metro buses from 2 September to 12 September 2017. Express routes X20 and X02 will divert, some bus stops will be closed, and extra route 502 services will operate on Main Road. Allow extra travel time on all routes as many Metro services will be delayed by either a diversion or congestion. Derwent Park Rd will be closed to all traffic between Main Rd and Sunderland St from Saturday 2 September to Tuesday 12 September 2017. The closure includes buses, whether they are in service or not. Traffic will not be able to turn onto Derwent Park Rd from Main Rd or Springfield Ave. Traffic will be directed to use alternative roads including Elwick Rd and Lampton Ave to the north, and Hopkins St and Albert Rd to the south. Please allow extra travel time on all Metro routes to account for potential delay. Traffic is expected to be impacted between Glenorchy and Moonah, adding up to five minutes extra travel time in peak hours. This, combined with diversions, will have an effect on the broader Metro network. The route X20 will travel between Glenorchy and Hobart City via Elwick Rd, stopping at a temporary stop on Brooker Ave near Derwent Park Rd, Brooker Ave stop 21 (near Ashbolt Cres), and the Hospital stop on Liverpool St (for inbound journeys only). This service usually travels via the Springfield interchange and Derwent Park Rd, meaning these stops will not be serviced during the diversion. If you normally board an outbound X20 at the Springfield interchange, catch an outbound Main Rd service to connect with the X20 in Glenorchy. If you normally board an inbound X20 at the Springfield interchange, catch an inbound X02 or X42 service to travel express to Hobart City, or any Turn Up and GO Main Rd service. The route X02 will travel between Glenorchy and Hobart City via Maid Rd, stopping at the Springfield interchange stop C, and the Hospital stop on Campbell St (on inbound journeys only). This service usually travels along Derwent Park Rd and Brooker Ave, meaning these stops will not be serviced during the diversion. Extra route 502 all stops services will operate on Main Road between the Springfield interchange and Hobart City. See below for a visual representation of this disruption. We apologise for any inconvenience caused by these works and appreciate your patience.